Father’s Day was a special one for the JEGS.com father-son Pro Mod team of Troy Coughlin Sr., left, and Troy Coughlin Jr. — Coughlin Sr. reached the semifinals and Coughlin Jr. the second round during the NHRA J&A Service Pro Mod Series event as part of the NHRA Thunder Valley Nationals on Sunday at Bristol Dragway. 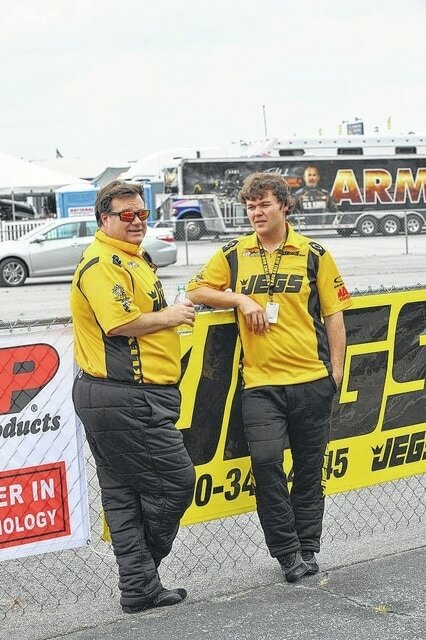 Father’s Day was a special time for the JEGS.com father-son Pro Mod team of Troy Coughlin Sr. and Troy Coughlin Jr., even though both drivers fell short of winning the NHRA J&A Service Pro Mod Series event as part of the NHRA Thunder Valley Nationals on Sunday at Bristol Dragway. Both drivers lost to No. 1 Bob Rahaim, as Troy Sr. fell in the semifinals and Troy Jr. in the second round. Still, racing together on Father’s Day was “a lot of fun,” Troy Jr. said. The best gift Troy Sr. received Sunday was getting to carry grandson Brodix — his daughter Meghan’s first child — on stage during driver intros. Meghan was at Bristol, too, making Troy Sr. one happy father. Troy Sr. started race day by beating No. 13 qualifier Clint Satterfield with a pass of 5.919 seconds at 251.81 mph, outrunning Satterfield’s 6.062-second pass at 246.71 mph. That matched Troy Sr. against No. 5 qualifier Billy Glidden in the second round, but Troy Sr. was up to the task with a 5.950-second run at 252.14 mph to edge Glidden’s 6.027 at 242.15 mph. In the semifinals, Troy Sr. had a .036-second advantage on the starting line thanks to a .054 light, but Rahaim ran him down with a pass of 5.896 seconds at 244.47 mph. Troy Sr.’s run was good, 5.947 seconds at 236.92 mph, but not quite good enough. “The new car and the new Pro Line engine combination is working out pretty good,” Troy Sr. said. “The more rounds we get on it, we get it a little bit better. It’s tough to go testing because you’re trying to find a test track that’s equivalent to what NHRA does. Troy Jr., the No. 9 qualifier, scored a mini-upset in the first round by beating Eric Dillard in a wild race. Dillard lost control and slammed into the outside wall as Troy Jr. skated to a pass of 6.246 seconds at 240.81 mph. Troy Jr. was stellar on the Tree against Rahaim with a .039 light, but his pass of 6.172 seconds at 233.48 mph wasn’t enough to hold off Rahaim’s 5.935-second run at 244.52 mph. The JEGS.com Pro Mod team returns in two weeks in Norwalk, Ohio, where Troy Sr. is the defending champion. Troy Sr. shared the winner’s circle in Norwalk with brother Mike, who won in Top Sportsman that day.